A red Necked Grebe spending time on the nest. While we were watching the pair took tuns sitting on the eggs so each could spend time gathering food. 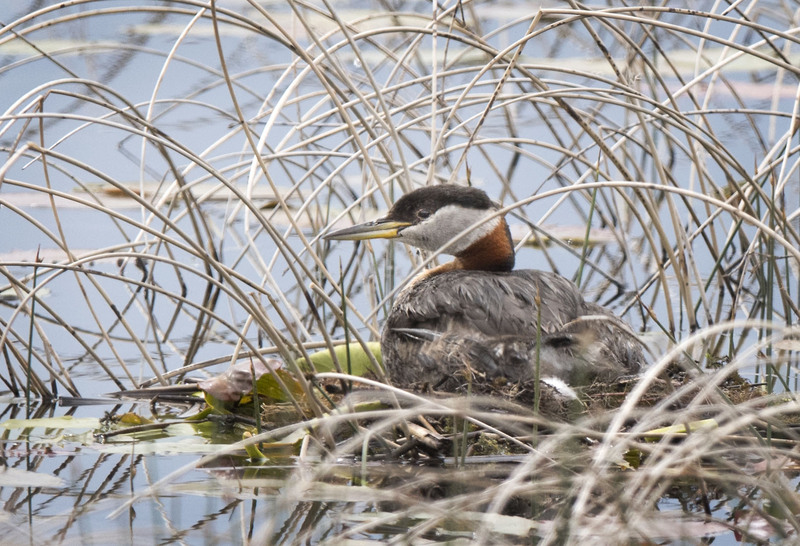 It is always a treat to see a red-necked grebe, and one on a nest is extraordinary. Thanks for sharing this peek, Mike. Thanks Jet and yes it is a treat and one we only infrequently experience. Have a wonderful weekend. Wow, what a beutiful bird! Red Necked Grebes are very good looking birds indeed. Perhaps you will run across one on your travels this year? Wishing you well and good luck on blogging and your trip. I hope you see one as well but there is so much to see I am sure you will see plenty. Sweet photo – I love all the curved reeds. HI Eliza, yes those reeds are interesting. In fact we have a couple of photos just of those reeds which really show the curves. Have a great Saturday.